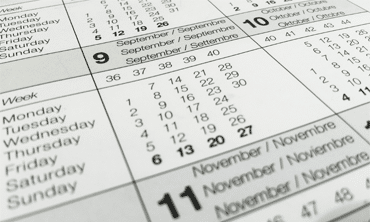 Why use a training calendar? Every employee in an organization or company values professional development and growth. Employee training calendar enables organizations to properly and efficiently plan for employee training so as to achieve desired goals. This improves productivity and reduces employee’s turnover. 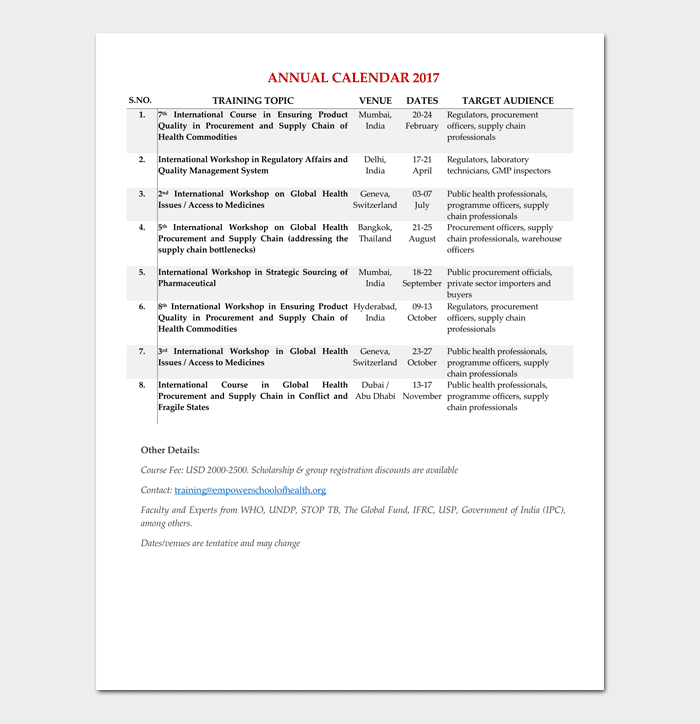 A monthly training calendar enables you to create and plan a professional training session and programs on monthly basis. This not only allows you to prioritize training sessions but also makes it easy to organize and effectively planning for training because it can be a hectic and tiresome activity. To drive its mission, special training, critical training and certifications that need to be attained or maintained an organization uses Annual training calendar to plan training for a whole year. This enables in the proper allocation of resources and also ensures all the necessary training activities that are important for the organization are carried out in time. Every one of us wants to look fit and healthy but trying to keep fit without strict control and schedule may just be a nightmare. 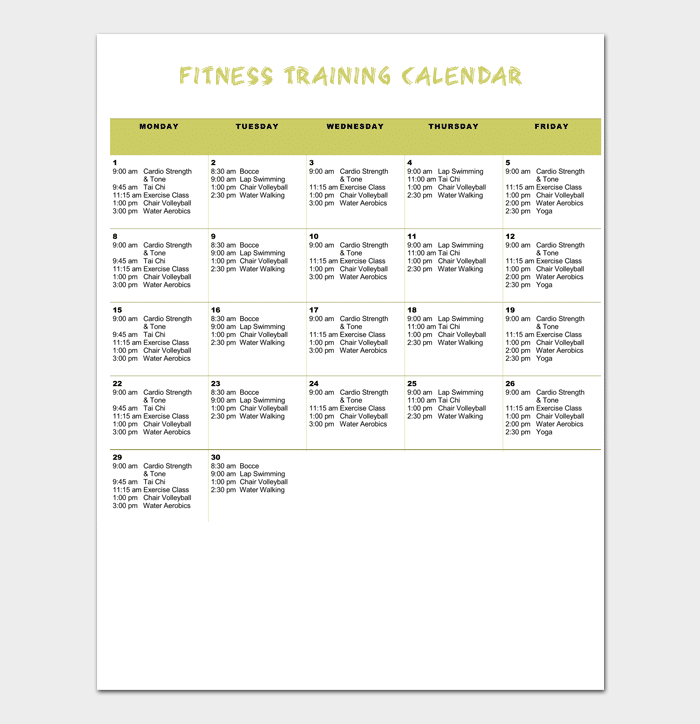 Fitness training calendar helps you to stay focused and motivated. The calendar makes sure you continue to work out timely and consistently to achieve your desired fitness goal. To up-skill existing employees: New technology or advancement of research necessitates staff to keep track on every development so as to improve and increase productivity. Having a training calendar makes it easy to achieve this. Comply with training requirement: Laws and regulations or even company values and mission statements may require regular proper and efficient training. 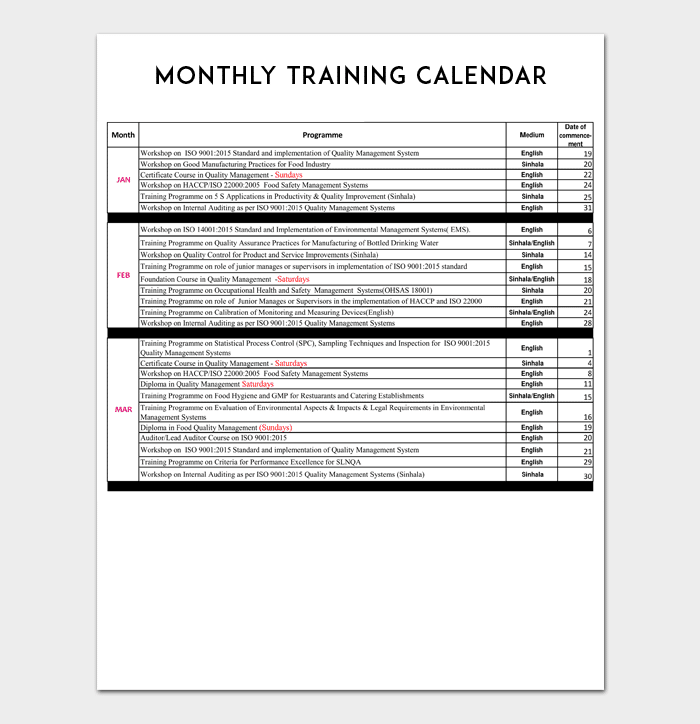 Designing a training calendar enables a company to keep track and monitor if this is achieved. Creating personal development and learning culture: Employees are the most valuable assets an organization can have, in fact having a happy workforce with know-how means increased productivity. Creating a good training calendar ensures employees learn and achieve their personal goal and development, therefore reducing employee turnover. Sharing information on training with others: Having a nice training schedule ensures that important and relevant information is passed on to others in time. This helps in timely adjusting to new information so as to increase productivity. Training new employees: Training calendar enables an organization to timely, adequately and properly plan for new staff. This ensures proper usage of resources and avoids time wastage.